I became interested in light and light quality while in high school. Everyone had a set of black light posters in their bedrooms. A black light is actually a lamp that generates ultraviolet light that we cannot see. The light emitted is UVA (400-315 nm) radiation. This is not UVB (315-280 nm), which is harmful. Human normal vision perceives light between 380 and 760 nm. When a black light bulb shines on a poster with fluorescent dyes, it will glow brightly. What you see glowing are phosphors. Modern laundry detergents contain phosphors that will convert UVA radiation to white light. This is why white T-shirts glow brighter than in normal sunlight. So, don't wear a white shirt when playing laser tag, you will lose (a dirty trick played on me by my teenage sons, I will admit). The critical issue when choosing a light source for growing plants is to understand the action spectra plant growth. Plants absorb light primarily in the blue and red wavelengths. Conversely, plants reflect light in the green wavelengths. The challenge for adopting lamps for growing plants indoors has been choosing the right bulb. Most lamp manufacturers report their lamps in terms of color temperature. What we think of as cool colors, blueish white, are at temperatures over 5,000°K and warm colors, yellowish white through red, are at color temperatures between 2,700-3,000°K. 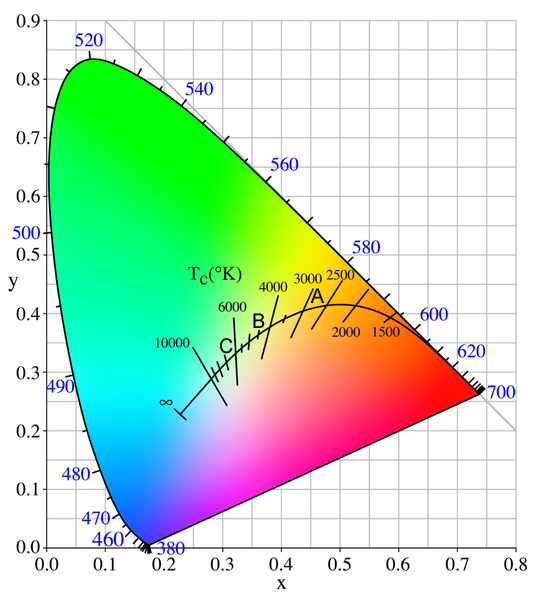 Color and light perception has been long studied and human color perception was first elegantly displayed in 1931 by the Commission Internationale de l'Eclairage (CIE) and advanced in 1978. We can then overlay color temperature onto the CIE diagrams. Most professional growing operations use high pressure sodium lamps, but this is likely to change in the future as lamp technologies improve. One new technology that we at Colorado State University evaluated was a light emitting plasma lamp or LEP. This lamp was introduced to us by the Polar-ray company in Boulder, Colo. The LEP lamp was the Stray Light PlasmaGrow G-1 manufactured by the Luxim Company. (for the design specifications on the exact lamp we used see: LiFi-STA-40-02) So we put it to the test. John Ray, Floriculture Research Associate and Plant and Environmental Research Center Greenhouse Manager, and his practicum students grew four bedding plant species, basil, snapdragon, tomato and zinnia, under two supplemental light sources, high pressure sodium (HPS) and light emitting plasma (LEP). The lamp height between the two were adjusted so that all plants received similar levels of photosynthetic active radiation (PAR). The lamps provided 18 hours of supplemental light in a polycarbonate glazed greenhouse. As you can see, the lamps are not similar in spectra, but what is the impact on plant growth? Dry weight data between the four species showed little difference between the two light sources. Which lamp would you choose? First, you would have to look at price. the LEP lamps are fairly pricey coming it at $1,350 compared to a HPS for around $300. Energy consumption however, may be a different story. The LEP lamp used consumes 273 watts where the HPS lamp used consumes 1,000 watts. So how does one determine efficiency? Most lamp manufacturers will report their lamp intensity in lumens. Luminous energy is light output in the visible spectra. The luminous energy rating for the LEP lamp was 14,000 lumens and for the HPS lamp, 110,000 lumens. That makes the luminous efficiency for the LEP lamp at 51.3 lumens/watt and the HPS at 110 lumens/watt. But is that relevant? There are two forms of chlorophyll, chlorophyll a and chlorophyll b. Chlorophyll absorbs the greatest amount of light energy at 430 nm and chlorophyll b absorbs the greatest amount of light energy at 662 nm. There are other carotenoids involved, but that is beyond what we are discussing here. Which one do you choose? That is strictly up to you. It's a pity that even university research conclusions are inaccurate and misleading. Actually the research data is correct as it clearly illustrates that 90 micromoles m-2 s-1 additional plasma light does not generate more yield in a greenhouse situation than additional HPS at low intensity applications on herbs. That's actually all that is proven in this trial. A modern horticultural HPS lamp such as the Philips Greenpower 1000W EL generates a PPF of more than 2000 micromoles s-1. The tested 270W plasma light generates about 250 micromoles s-1, making the HPS lamp about twice as efficient generating PAR light than the plasma light. What you don't take into account in your conclusion is that the 1000W lamp is able to deliver a ppfd of 90 micromoles m-2 s-1 on a surface of 20 square meters, where the plasma light will only do that on a 2,5 square meter surface. The only thing you prove in this trial is that at low intensity additional lighting in the winter period in a greenhouse situation the PAR spectrum of a plasma lamp performs at least equal to the PAR spectrum of a HPS lamp, which is in line with current research results about assimilation lighting in greenhouses. Furthermore you need twice the amount of electricity to get those 90 micromoles m-2 s-s from the 40.01 module compared to the HPS lamp, making the HPS lamp twice as efficient for this purpose at less than half the price, including lamp changes and maintenance during its life cycle, using 50% less energy. Now I am not saying that there is no place for plasma lighting in greenhouses, on contrary, but not as a replacement for HPS. Plasma light can add valuable quality spectrum to the assimilation light in low light or climate room conditions, influencing the morphology of the plant and the quality of the end product by offering a more complete additional spectrum of light. The lack of red light makes it less efficient for assimilation light purposes. I might add that there are new plasma modules available from LUXIM that perform better than the tested 40.02 module. There is a place for Plasma in this industry, but it is not the replacement of HPS light in Greenhouses (yet). Thank you for this in-depth article. Can't help but share it to our readers. Great article ... I really like the writer for allotting his time to write this impressive article. Buy indoor grow lights in online.